TomTom's One v4 is the company's entry-level sat nav device, shunning such features as Bluetooth or real-time traffic updates in order to keep the price down. That said, it's still one of the most expensive entry-level units we've seen. Unlike some of its budget rivals, however, corners haven't been cut on quality. The plastics are tough and the device is compact, making it feel every bit as strong as units costing twice as much. The square 3.5-inch touchscreen display is a lot smaller than you'll find on most of the latest sat-navs, but we didn't find this to be an issue. The Tele Atlas mapping is the same as you'll find on more expensive models, with a colourful and clear, if slightly simple-looking, design. The intuitive, finger-friendly menus we've come to expect from TomTom are all present and correct, and offer excellent usability. It's easy to choose destinations from addresses, postcodes, towns and points of interest (POI), and you can also select from previous destinations. 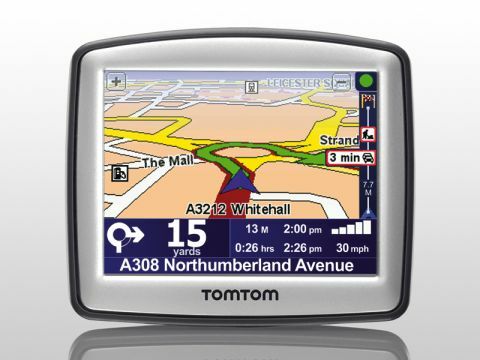 Although previous TomTom products featured the latest SiRFStar III chipset for the most accurate navigation, TomTom refused to confirm exactly which GPS chip this model uses. Once locked on, however, the GPS chip had no trouble holding a signal throughout our test routes, and we found that our review unit was also quick to switch on for subsequent trips. Routes proved accurate throughout and directions were easy to follow. That said, we did miss the company's latest lane-guidance software – a feature only available on more costly models. The large speaker on the rear is more than loud enough, and automatically gets louder the faster you drive. Features include speed camera locations, although these won't be updated unless you opt for an annual subscription (£20 inc. VAT). One of the most impressive features, which also distinguishes it from more expensive models, is the incredibly compact clip-on cradle to attach it to your car's window. Smaller than any other such cradle we've seen to date, it offers faultless usability, holding the One firmly in place as you drive. Folding flush against the rear of the device, it's also easy to take with you when you leave the car. You'll also find an in-car charger that plugs into the bottom of the One via a mini-USB port. Battery life, at just over two hours, is enough for shorter journeys. Overall, it's refreshing to find a simple and easy-to-use device not laden down with features you'll never use. The compact size is ideal, and while this isn't the cheapest entry-level unit on the market, it's one of the best.